"On behalf of all my colleagues who attended yesterday's event—wanted to take a moment to say thank you very much for all the help and support you have provided before and during the event. The event went really well on all the fronts, and everyone had such a great time for a such a great cause." "I have enjoyed, so much, working with you over the last 6 months. I could not have asked for a better team building experience. You consistently delivered a delightful bridge building event and you are such a great fit for our culture. "I will continue to keep Team Building Unlimited at the top of my list as a vendor. I have shared my recommendation to other training and administrative folks in my organization." "We all had a blast and people are saying it's their favorite offsite to date! Thanks so much to both of you!" "Thanks again for helping us facilitate a successful team building event. Your folks were engaging, professional, and very personable. Everyone had a great time!" "Everyone enjoyed the bike building event yesterday. Thank you for making our event a big success. It's was a very rewarding experience to have fun, while giving back to our community." "Frank, thanks again for a great event. We had a fun time recapping today all the highlights of event. Everyone thought you were a great facilitator and enjoyed working with you. You brought a lot of energy, humor and passion. We all thought it was a great personal touch and clever how you incorporated people's interests into it, too. We'll definitely recommend Team Building Unlimited to anyone looking for something fun and unique." "Your team did a wonderful job leading our team building event! It was the perfect way to end a long week and bring the two groups together. We received lots of positive feedback, and we look forward to working with you again in the future." "Thank you for a successful event last Friday. We really enjoyed all the games your team prepared. It was a great time to bond with co-workers and new friends. We will certainly contact your team in the future for similar activities and will also recommend you to other companies." "Thank you for hosting such a fantastic event!!!" "Just wanted to send a quick thank you for everything last night. The team has been talking quite a bit about how much fun they had!" "The Cupcake Challenge was a huge success. Everyone is talking about it. They loved it. Thanks so much for putting this together for us, great time was had by all. The photos will make a great story on our internal website!" "Thank you both for assisting us in setting up our team building challenge. Everyone enjoyed it. We will definitely call you when we plan our next event." "Thank you so much for all of your hard work and dedication to the event! The feedback from the event has been super positive. You all are stellar, and I can't wait to use you again!" "Thank you so very much for yesterday’s Sandcastle Building team event! Our team had a great time and weather turned out great!" "We would like to thank you for doing such a remarkable job in organizing and getting our group pumped-up to make the Blankets of Hope. The feedback from the team was very positive. When we arrived to deliver the blankets to the Senior home, they were very excited to receive them. Thank you so much." "Everyone really enjoyed our Arresting Detective event. You were awesome. This was one of the best holiday parties we've had in a long time. Thanks again!" "I just wanted to send a heartfelt THANK YOU for all your efforts & patience with us with the changes for this offsite meeting! Everyone had a great time & Frank & his assistant were awesome! I've had people come up to me over the last couple of days & tell me how much they enjoyed building something for kids & what a unique experience it was. I'll reach out the next time I'm asked to plan a group activity." "I just wanted to let you know the Wacky Mini-Olympic Wine Games went well and was very well received. Thanks so much to Mark and Frank for doing a great job! I'm delighted to know about your operations." "Everyone in our group is still talking about the Rocking Horse event, it was fun and very rewarding!!! Thanks again for a great afternoon!" "Just wanted to say thanks again. We loved Frank and had a great afternoon with our Wacky Mini-Olympic Games. I've had several sincere thank yous since Tuesday. Great job!" 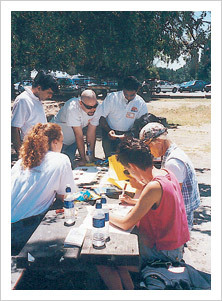 "My team really enjoyed the team building activities that George and Frank facilitated. Several individuals have told me it was the best company event they have attended. Thank you for helping to make our summer event a huge success." "On behalf of our team we just wanted to send a BIG Thank You for the event on Friday! The team had a great time and really enjoyed working with everyone and laughing together." "Our team had a great time participating in the build-a-bike team event! It was such a feel-good activity, and actually made me realize that after 6 kids, I've never built any of their bikes! Wishing you much continued success." "Thank you again for thinking of the Healdsburg Boys and Girls Club!! The Members LOVED their bikes!! Not only did the Members appreciate the bikes, it was fun to watch the expressions on the parents' faces as well!! "The smallest of the bikes was the last one presented to a Member as we were trying to find the perfect fit for such an awesome bike!! We finally found a great match with a rambunctious little boy who will spend hours pedaling around Healdsburg burning off energy!! When he saw the bike, his eyes lit up, he hopped on as the mother watched, and he happily took off out the door with her running behind him. "Thank you so much for your time and energy!! It was greatly appreciated by the entire Healdsburg Boys and Girls Club of Central Sonoma County community!!" "Thank you! We're continuing to receive great feedback on the Gingerbread House Building Competition Event. We appreciate your efforts in making it such a charismatic, personalized experience!" "We had a great Gingerbread House Building Competition event yesterday. Everyone had a great time! It was fun to see everyone working together and imparting their creativity and interpretations of what a gingerbread house should be. Thanks again to Frank and his team (George and Megan) for their flexibility and working within our time parameters and making this such a fun event." "It was so awesome! Everyone loved it and the bears were adorable. Three of our Oakland Medical Center managers took the bears to deliver to the pediatric unit. We will definitely be in touch next year for our graduation (or before if we have another reason to celebrate :)." "Our event was very successful. Our team had a great time and enjoyed the engaging games that Frank had prepared for our group. Frank did a fantastic job along with George. I received lots of positive feedback from our group saying how much fun they had. Thank you so much for a great job well done." "Great rocking horses! Great team builder! Everyone loved it!!" "The Grand Prix was just great. We really enjoyed the event so much so that we have each car headed back to Palo Alto with a team member, and we have an area on campus where we will display the cars and t-shirts. We will certainly keep you in mind for future team activities. This offsite has been so well received that they want us to start scheduling the next one!" "Thank you very much for the lovely Wacky Games Day on Tuesday. We got a lot of positive feedback and everyone really enjoyed it. Also, thank you Frank for announcing the second venue. This made the turn-out much more than we expected, which was great!" "We had a terrific time!! The cast was hilarious as was your script. I was amazed that they were able to keep our group so engaged for so long. Their adlibbing was the best part! I will be sure to send referrals as I receive requests for team building ideas." "Everyone had such a great time, saying it was the best event they'd ever been to! Your team was hilarious, and we are so glad that we went with you guys. I will certainly keep you in mind for future events as well." "Peter and Deb were great facilitators and did a nice job handling our group of 80. Everyone had such a wonderful time at both events (Explore SFMOMA and the Sangria Challenge)! I saw lots of smiling, laughing, and team building. Working with you to make sure we had everything lined up at the venues was a big help. I also appreciate that you were so flexible with our timeline. I got a lot of positive feedback and I owe it to TeamBuilding Unlimited/Murder on the Menu." "Thank you for facilitating our teambuilding event; we had great response from the team! They were excited about the event, thought it was really fun and different. It was fun seeing everyone work together and it was an even better time watching the teams present." —Annette Sebastiani, Gilead Sciences, Inc.
"Team APAC had the most amazing evening & I'm proud to say, still raving about their dance moves today! I caught one of the girls doing some moves at the airport this morning (but we won't tell her I said anything!) Thanks for making our night such a success! I look forward to working with you again in the future. Your team are superstars!" "Thank you SO much, you were wonderful and everyone had the best time. I've received great feedback from the participants. Thank you for making the 'graduation' special. We will contact you again in the future!" "Frank and your team did a great job as usual. Our group had a fun time putting together and painting the rocking horses. I look forward to working with you and your team in 2013." "Thanks again for another hugely successful event. My boss is REALLY happy. You make me look great, guys! Looking forward to our next event ;-)"
"It was a pleasure to work with TeamBuilding Unlimited/Murder on the Menu again. I really appreciated having Frank as a facilitator, especially all the research and time he put into putting together our scavenger hunt. For the books: TeamBuilding Unlimited/Murder on the Menu does their homework! I was confident that our activity was going to be a success because of how much background is involved: TCs and emails to understand the group and meeting goals, flexibility in the service agreement, and professional background of the employees. (I was really impressed to learn of Frank's background in the Peace Corps and as a teacher.) Many thanks again and I look forward to working with your group or participating in another one of your teambuilding activities." "Thank You for a great Team Building Event. All the team loved it and could not stop talking about it. Frank, everyone loved the theme and the prizes and of course, the way you got everyone involved. Thank you once again." —Bharati Mirchandani, Dura Chemicals. Inc.
"Thanks so much to you and Frank for making our annual meeting such a fun event. I know I speak for everyone in attendance at the Bears that Care—we had a great time and many felt they really made a difference for some child by making the stuffed animal." "Thank you to the Team Building Unlimited team for your involvement at the KPCB CEO Summit—the activity was very well received. While the group was small, I know everyone involved enjoyed the team building aspect—and the opportunity to give back and build some 'fun' for children in need. If you ever need a corporate/event reference, I would be happy to provide that for you." "The scavenger hunt list was great fun and a success! Our employees really liked the opportunity to explore." "Thank you very much for have organized a wonderful Charity Challenge team building event for us. Frank was fantastic, so thoughtful and funny, kept the fun going. We all had a great time." "Since our event was a surprise to the group, everyone was pleasantly surprised with the Corporate Grand Prix team event. They had so much fun building the carts and racing them, we have a very competitive team! Everyone also enjoyed the gifts and prizes that were handed out. Frank and the team were great and very well prepared for our group and helped us stick to our timeline. I will definitely keep your company in mind for the next company outing and team building event. Thanks again for all of your help in planning a successful event!" "Thanks for all your help on the Cannery Row Scavenger Hunt. You did a great job. It was really fun!" "Thank you so much. Even with short notice, you guys came through for us. Thank you so much for always taking my calls, thank you for understanding that changes need to happen and being so accommodating. The on-site team was truly a joy to work with. My team thought this was the perfect activity for our group and no doubt that was due to the on-site team. Looking forward to our next event." "Thanks for the fun event today. We had a great time and appreciate your enthusiasm and fun facts. It was the perfect ending to our day." "The horses were gone within ONE day. We were planning to keep two of them at the House but the kids were having so much fun. They had the biggest smiles when Ron said they could have them as their own. What a wonderful gift. The horses are a perfect project for the House since we always have children in that age range. I'm happy I was able to be a part of it." "We totally appreciate you facilitating our special day. You really helped all of us to be at ease with the events of the day, and made us all smile and enjoy each other's company, and take pride in the efforts of painting our horses, and making us feel adept in assembling our bikes. Most of all, the goal was for all of us to spend time and get to know one another on a personal level. Thanks to you, it was a job well done. All in all it was a fabulous day thanks to you! I'm sure the others will be contact you to setup teambuilding for their own groups." "It was a pleasure to work with you! I keep seeing those gorgeous rocking horses in my mind's eye and it makes me feel so great. Shannon from the Ronald McDonald House told me she'd already distributed some of them and that the children's faces just lit up. Thanks so much." "Regarding the bike build—it was indeed a success. The center worked perfectly as a location and the kids had a great time! ...As did the adults! All in all, a super successful event. Thanks for all your help." "Many thanks for an outstanding Building Bears program that Peter led with our group. It was really a wonderful experience which our team enjoyed very much! I delivered the bears personally to the Ronald McDonald House and they were entirely grateful. Thanks again to you and your team for making this such a meaningful experience." "Re: The Noir of Chocolate and Wine Tasting. Thanks for the fun event today. We had a great time and appreciate your enthusiasm and fun facts. It was the perfect ending to our day." "Yesterday's event was a great success. We had great feedback from our guests. Thank you for going extra mile to make this event joyful. Lots of laughter and fun. I am sure guests will talk about this event for a while. It is always great to work with you and hope that we will work together soon." "Thanks Janet for the wonderful Scavenger Hunt at the Tech Museum. Peter did a great job, and everyone had a great time. The presentations were so much fun to watch!" "Our team really enjoyed the Bikes for Kids Charity Challenge. Many of our team expressed that this event had a profound impact for them. Thanks a lot for everything!" "Thank you for an excellent event! The team thoroughly enjoyed the games and most especially building the bikes to donate to charity. I will definitely recommend your company for others looking for a TeamBuilding activity." "Thank you again for doing such an awesome job with our employees on both the events." 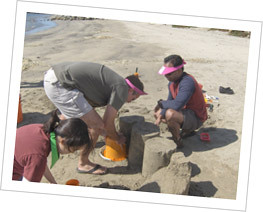 "Our executive event at HMB was GREAT... in part due to the very fun wacky mini Olympics!! Frank was awesome—he knew how to work the participants to get them quickly involved and having fun. It was great to work with your company from the start to the finish and I hope to have future opportunities to work together again." "Thank you for putting on such a great event for us! Everyone commented on how much fun it was, and how great it felt to do something for kids in need! Frank, you did a great job with poking fun at people and getting everyone enthused for the mini games, and a special thanks for being so flexible to work in the limited space we had!" 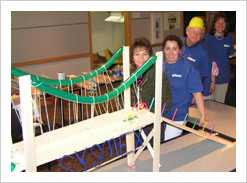 "Thank you so much for joining us yesterday and leading the group in the Building Bridges activity! Everyone learned some valuable things and had a lot of fun while doing it. It was a pleasure working with you! I hope we have a chance to work together again in the future." "THANK YOU so much! Your team was wonderful!!! I truly could not have pulled it off without all of you! I am so excited that children will be receiving specially made bears while in the hospital—this is really special. My manager says this event may just be the first of a tradition :-)"
"Thank you and your team. It was a lot of fun and the group had a good time. We have them fill out surveys and the end of the conference and this activity rated the highest." "Great job guys! Good feedback from all! It was important that all got a chance to participate and we accomplished that today... I hope to work w/ you guys again in the future!!!" "It was GREAT! Thanks Frank! Everyone had such a good time...we are a pretty competitive bunch if you couldn't tell. =)"
"We had a fabulous time. The team is still talking about it. Bruce, our boss, raved about it again this morning. Much in thanks to you. I'll be in touch for next year's event for sure. Hopefully maybe sooner! You're wonderful to work with." "Thank you so much for making the Sangria challenge fun and engaging for us all (myself included). We all had a wonderful time yesterday and we will definitely call you the next time we are in need of a fun group activity. I could not have been more pleased with the outcome." "Thank you for putting together a fun and wonderful scavenger hunt! We all enjoyed it." "Thank YOU for making it such a wonderful, fun and engaging experience. The team really did enjoy this event, especially knowing we were giving to children in need. "Your energy and comedy made it a lot of fun, and I appreciate that you were so organized and gave great direction. The process was perfect with our timing constraints. "I will certainly look to your group for future team building and am sharing your information with other admins and a couple of our partners who were there with us who will reach out for an event they will have in the next couple months." "Thank you so much for making our Manager's Meeting a great success. Everyone gave you high praise for your execution of the challenge, and they were impressed with how well you kept the exercise going. We all have differences and varied ways of completing task; however, this was a way to build a better network in doing so. This was a awesome day for our team, and will long be remembered. Your spirit and passion came through and made it great." —Melanie Acker, Director of Human Resources, GSC Logistics, Inc.
"This was a FANTASTIC event!!! Everyone could not have been nicer. The 'animals' are wonderfully snuggly!! Thank you for your support." "I very much enjoyed working with you and Frank on our charitable event. We've received many emails from attendees raving about how excited they were to create the animals and t-shirts for children in the Bay Area. It was especially great to work with Frank. He was excellent at communicating and listening to our needs and made extended efforts to tweak the program with our requests." "Thank you! The team had a great time! We will definitely consider you for another event in the future." "Thank you so much for making a success of our teambuilding Bikes for Kids activity on such short notice and under such a time constraint. We heard great feedback from our participants during our hosted lunch following the activity. We look forward to working with you and TeamBuilding Unlimited in the future." "The feedback from my team was great. I really like the part where we designed a shirt for the bear and the T-shirt as well. It makes it interactive, fun, creative and boosts the morale of our team. It is great to see our group working together. I am looking forward working with TeamBuilding Unlimited again." "The Have Your Cake and Eat it, Too! Challenge met our group's goals and objectives. Every participant was happily engaged in the activity. We walked away from the event with smiles on our faces, and we really do feel like a stronger team." "Thanks so much, Frank, for your time and efforts for our wonderful Wine Games this week. So appreciate it! We look forward to having an opportunity to working together again!" "Thank you, Janet, we all had a great time too. Some people in the group said that giving (the Trikes) to a charity meant more to them than any team building activity we had ever done." "Thank you! You and your team were so helpful in making this a successful event. We'll definitely keep you guys in mind for next time we plan our events." "Thanks so much for all of your help. Our event was such a success! We put together approximately 75 boxes and are preparing for them to ship today." —Shannon L. O'Connor, Fred Alger Management, Inc.
"I just want to send you and the team a BIG THANK YOU note for the awesome job done last Friday in our team building event. The performance was very professional and entertaining. The feedback afterwards was very positive. My team needed a good time to vent out all the stress from almost two months of continued hard work. It was awesome to see them laughing and enjoying the time together... Some people approached me because they loved the concept and they would like to do something similar in the future. So, I am giving your name to others already... It is great to have a professional and talented company like yours that is able to provide a product of quality to fulfill the needs of our team buildings. I will definitively consider you for future team buildings for my team... THANKS A LOT!!!" "Our associates had an AMAZING time! We have been hearing positive feedback from them all week about how much fun they had, how great the actors were, the storyline etc... Your company again did an incredible job! Thank you so much and we definitely look forward to working with you again!" —Regina Eugea, BRE Properties, Inc. "Wow!! Hilarious!! Fun!! The 'Arresting Detective' was the hit of our dinner. Frank was wonderful to work with, answering all of my questions in a timely manner and making me feel at ease with the event. Peter 'The Detective' was so entertaining! His routine was awesome—it was so funny to see the surprise on people's faces. We would love to do this again." "Frank did such a great job with the Bears that Care event in SF yesterday. He has such wonderful energy and everything went smoothly. We have 165 beautiful stuffed animals for deserving children. Thank you for making us the recipients! You might like to know that the 165 stuffed animals are going to our partners at Blind Babies Assn. in Oakland, Kaiser Pediatrics Oncology, and InnVision in East Palo Alto, who do temporary housing for families in East Palo Alto. They are all thrilled to get such a personal, quality donation from us. You are Santa!" "I wanted to send you a note as soon as I got into the office to tell you how much fun the whole team had. I've received nothing but positive comments from everyone. They were able to relax and enjoy the zoo while searching for the answers. I think everyone did a good job on their presentations, and I now realize how much creative talent we have. That was so fun. I will definitely keep TeamBuilding Unlimited in mind for future events." "The feedback has been VERY positive. Everyone said they enjoyed themselves and that the games were a lot of fun. We appreciate all that you did for us. What fun! Thanks again!" 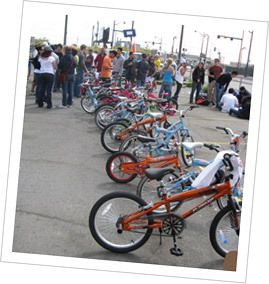 —Kim Revel, Capital Performance Advisors, Thomas, Wirig, Doll & Co.
"My team really enjoyed our Trikes for Tots event, and, especially, working with you." "We had a BLAST!! Even those of us who are shy commented on how fun the event was. It was pure talent that got a group of geologists, chemists and scientists laughing!! The actors were absolutely amazing! We were all so impressed that they knew so much about each of us that they incorporated into the Mystery." "Thank you for a very fun, informative and tasty event." "Lots of good feedback on our teambuilding event. You were a hit and your energy level would be hard to replicate!" 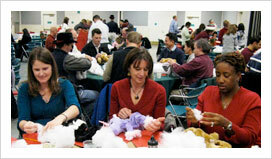 "Re: Operation Military Giving: The event was a huge success and the feedback is very positive. People thought it was a wonderful opportunity to give back, some wished they would have known about it ahead of time so they could have brought stuff from home to include in the boxes, others would have liked to have created more packages, and some are exploring doing care packages on their own, adopting a soldier, sponsoring a soldier during fleet week, and much much more. The people in this department are all about giving back and this activity just gave them additional ideas to do so!" "Everyone had a great time on the Scavenger Hunt at the California Academy of Sciences today! Thank you for working with us and making accommodations to meet our budget." "We had a great time—it was the most fun team builder anyone can remember. Thanks for turning it around so quickly for us!" "Thanks to you and your team for a great event at the Mountain Winery! People really appreciated how much of eBay you incorporated into the event." "Thank you both for your work in ensuring that everyone had such a great day. What a treat it was to be able to get together as a team and just relax and have some fun." "Feedback on our event was so positive—with rave reviews thrown in from some folks. Thank you for your efforts—you set such a good tone right from the start that carried on throughout the day to make the whole day work well." "I received fantastic feedback on the AdventureQuest at the California Academy of Sciences. I sure wish that I could have been there in person. I'm sure word of mouth about this event will get out and people will be asking me about this. I will certainly direct them to you." "Thanks again for a wonderful event. My team had a great time and Frank, you were awesome! I will highly recommend your company for any event and will use you again in a heartbeat!" "Thanks to you for your organization, creativity, and high energy leadership in hosting our teambuilding event. You made me look good!" "Thanks for an incredible team-building event. Everyone on my team expressed how much they enjoyed spending time with Frank at the Cal Academy of Sciences. I really do appreciate you both working with me and my team with no more than a few days to plan. And the prizes were a fabulous touch... thanks for an amazing day!" "It was so much fun!! Everybody enjoyed every single Wacky Game. You ROCK!! I will definitely like to hire you for my future events." "We had such a fun event, and I was glad to see so many people participate!" "Thank YOU! I really enjoyed partnering with you. You have such a natural ease and energy. You made it fun for all." "Thank you for a wonderful evening! Everyone really enjoyed participating and felt good about the experience and what it meant—giving back to our troops! All of you were just great and your attention to detail, organization and flexibility made for a seamless event." "We so enjoyed our detective and police roast of our students and teachers... it was much fun. And incorporating the storylines and the gag gifts was just perfect. The captain of the charter said he has many groups of high school students on his boat... and this group was the best ever... amazed at their attention and excitement with your actors as well as the sunset cruise with very calm waters. We will definitely use your group again!" "I wanted to thank you and your team for such a successful event. My client loved the program. Can't wait to work with you again on their next program!" "Thanks for a fun evening. Enjoyed by all!" "Thank you so much for helping us put this together. It was a lot of fun and people are still talking about it! We will definitely keep you in mind for future events." "Our Scavenger Quest on Angel Island was amazing. Everyone had so much fun and felt the team building was very constructive. Thank you for all your hard work in this event! We truly enjoyed meeting and working with you!" "We had a fabulous time with Frank! I think everyone was really surprised (this was a very different type of event for us). Thank you so much for working with us (and our little budget). We very much appreciate your efforts!" "The party went very well and I want to thank you for your presentation. I know that many people were surprised by the many facts and tastes—I know that I was. I did note that Amir kept the t-shirt on all night and closed out the evening with it on!! Thank you for adding to our successful party!!" "Thank you for putting on such a great event! The Genentech people were very pleased, and I know Chef and I had a great time as well. If I ever have a group that is interested in doing these fun events you have my word that you will be the first I recommend." "Thank you for the excellent job you did with my team. They had a great time and thought you worked for Unilever because you knew so much about everyone one. You really added to the meeting." "This event was amazing. Our entire team had a wonderful time and found the team building to be very beneficial! Thank you for all your hard work in this event! I plan various events both locally and around the country; I will keep you in mind for future events." "Thank you so much for putting the team builder together. Everyone had so much fun and really enjoyed themselves. Frank was WONDERFUL! I am looking forward to working with the both of you again soon." "Everyone here at Thomas York had a great time on our Scavenger Hunt last week. Thank you for putting together such a fun & detailed event for us!" "Thanks again for providing us with an evening of fun. Everyone really enjoyed it. I've heard some really great comments. We will keep you in mind for other groups and activities next year." "Thank you for the excellent job you did with my team. They had a great time and thought you worked for Unilever because you knew so much about everyone. You really added to the meeting." "Janet and her company has demonstrated time and again not only a high level of artistic dedication but also an ability for articulate marketing and getting the job done in all its many interesting permutations." "Janet has provided fabulous team-building experiences for me many times over the past 10 years. She and her team are always collaborative—a key ingredient to successful team-building outcomes. From murder mystery dinners, to designing golf greens, to scavenger hunts, each time Janet & her team delivered success. They get it!" 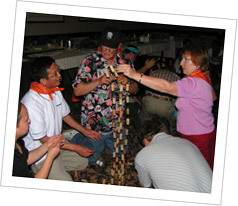 "I highly recommend the dynamic duo of Janet and Frank for teambuilding events. They are fun, and create experiences that are memorable and well produced. Janet and Frank listen to what you need and what outcomes are expected—and they deliver!" "We had a blast yesterday—Frank did a fabulous job on our Bears that Care Event, and I have received very positive feedback about the entire event!" "The chocolate tasting was a big hit because we are all culinary/wine people and the experience you shared with us was very unique. You did a great job of gauging the interests of the group and then focused your time and energy on the activity they showed great interest in. It was fun to compare tasting notes with the other guests at my table. The other activities were great for a preview of what you offer." "The whole creativeness behind the bridge building helped everyone get creative, toss ideas back and forth, and work as a team to do something enjoyable." "I would recommend Janet for any team building, or special event with a unique and truly entertaining twist." "Everyone had a blast. You did a great job getting everyone involved and I was very surprised to see people really get into the event! There were some usually 'shy' individuals who actually took the microphone to say something! That alone, was fantastic." "Our company party is one we will remember for years to come! It was a pleasure preparing the presentation with you and my other 'partners in crime.' Your staff was wonderful and it was a joy working with them." "The evening really accomplished more than we ever imagined with tying our 4 offices together and helping everyone get acquainted, especially since most of us really didn't know more than a voice over the phone until that evening." "You don't know how hard it is to get a group of accountants, actuaries & financial analysts together in one room laughing! Job well done!" "We had a blast!!! Frank was so enthusiastic it was hard not to be as well. The Scavenger Quest was definitely a great experience and a memorable retreat." "You and your cast did a fabulous job! It was very entertaining and well done." "Frank did a GREAT job yesterday! Please pass on our appreciation and gratitude for a job well done!" "Thanks so much for taking the time to 'surprise' our team with your wonderful 'Detective' sleuthing skills, the fabulous Chocolate Tasting extravaganza and Team Building Competition! Everyone really enjoyed your great sense of humor, chocolate knowledge and 'personalized' prizes. Thanks to you, everyone left the 'party,' I mean, meeting with a souvenir of the day's activities!" "The Murder Mystery turned out great! People were talking about it for days afterwards and nearly everyone was in stitches during the event." "Everyone in my unit really enjoyed themselves with both the chocolate tasting and the mini Olympics, but the icing on the cake was building all those shiny tricycles for the kids!" "Once you got them into their teams and started, they were unstoppable! Pier 39 in San Francisco was the perfect spot for the Scavenger/Planning portion of the activity and the team presentations were the hit of the event." "We had a fabulous time with your team. EVERYONE had a great time—I think the international attendees had even more fun than the US team!!" "The event was indeed terrific. I personally appreciated all the details you built in there in such a short timeframe! You are so flexible!" "Our goals to create fun memories and build up morale were accomplished, thanks to you and your team." "Working with government organizations does not necessarily allow a great deal of time for team building, laughing and experiencing new aspects of people's personalities—but our teambuilding event definitely did that." "My group had a wonderful time and all were not only pleased but were impressed that you used the correct acronyms with the correct context, etc. They loved it!!!" —Jodi Hayes, Meeting Solutions, Inc.
"Everyone had a great time thanks in part to your enthusiasm and professionalism." "Wanted to let you know that the teambuilding Scavenger Quest you designed for us in New Hope, PA, was great. Everyone had fun and as you saw for yourself, we have a very competitive team." "Our management team thoroughly enjoyed the 'Grand Prix' team-building exercise and were quite surprised and enthusiastic about the competitive atmosphere and working together. You provided the right level of energy and help to give our group a very unique and new team-building experience for our meeting." "I/we really appreciate your throwing yourself and your creative energies full throttle into making the most of this, the second of our Teambuilding Unlimited/Murder on the Menu One-Two Punch team building events." "AWESOME!!!!!!! I can't thank you enough for making the Chamber look so good today in front of our President Circle Diamond & Premier level members." "I want to THANK YOU and your team for putting on a wonderful event for our group. Our team kept talking about the event long after it was over!" "Thank you very much for all of your group's efforts in bringing this fun event to our off-site. Everyone truly enjoyed it, and the management of the event was flawless." "You don't know how hard it is to get a group of accountants, actuaries & financial analysts together in one room laughing. Job well done!" "I can't remember the last time that I laughed so hard. It was a pleasure working with you!" "We want to thank you so much for the wonderful job you did with our Schwab IPM Scavenger Quest. It was loads of fun. Everyone had a wonderful time." "Wow! We are dragging a little around here today—the price we pay for having too much fun!" "Frank, you did a great job, as always, and everyone had a great time. Nancy from the Kinship Organization presented very nicely how meaningful our trikes will be to the children. We look forward to getting creative with you and Janet and planning another event."